Our 100% made in the USA "Ducks On The Pond" has finally arrived!! Celebrate two great American icons invented in America: Baseball and the Rubber Duck. Show support to your team when runners are on base... lift your duck in the air, or wave your "Ducks On The Pond" rally towel... two great ways to encourage the batter to bring the runners home. 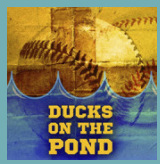 Please take a few minutes to read about the history of "Ducks On The Pond" and how we've joined two symbols of Americana, baseball and the rubber duck, to form a modern take on a vintage baseball term. Check back for updated logo colors to match your team's jerseys as well as other "Ducks On The Pond" memorabilia. Click to explore the pond!